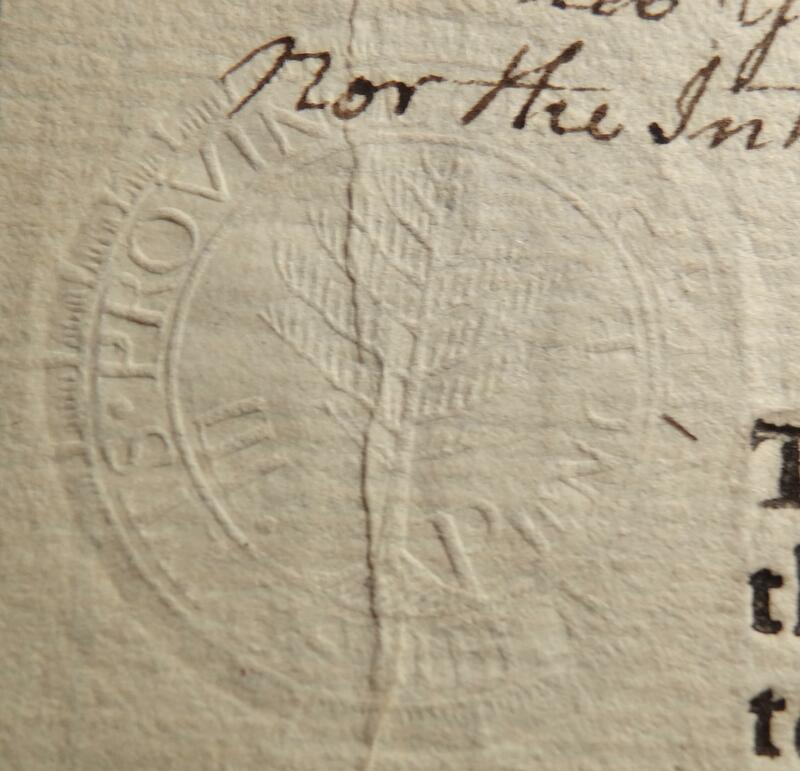 Various documents were required to pay a tax, evidence of which was an embossed stamp similar to the stamps used by Notary Publics. In most cases the preestamped paper was sold to the public for preparation of the various documents subject to the tax. There are two types of paper used, wove and laid. Both papers were produced on wire cloth. The wove paper the cloth has close even spaced wires producing a smooth paper with no light and dark lines. Laqid apercthe wire is crossed by cross wires at much wider intervals producing with show alternate light and dark lines. Massachusetts Colony instituted a documentary tax in 1755. New York followed soon thereafter. In 1765, Britain passed the Stamp Act in Colonial America. This stamp is located in the lower left corner of the document. The stamp, Scott no. RM3, features a Pine Tree with the denomination III PENCE in the center. The outside ring reads PROVINCE OF THE MASSACHUSETTS. Originally Federal revenue was raised by customs duties, and taxing alcohol, domestic and imported. The Whiskey Rebellion of 1794 started as a result of these taxes., In 1797 leadership realized that other sources of revenue need to be found. Congress then reinstituted the documentary tax It applied to vellum, parchment an d paper. 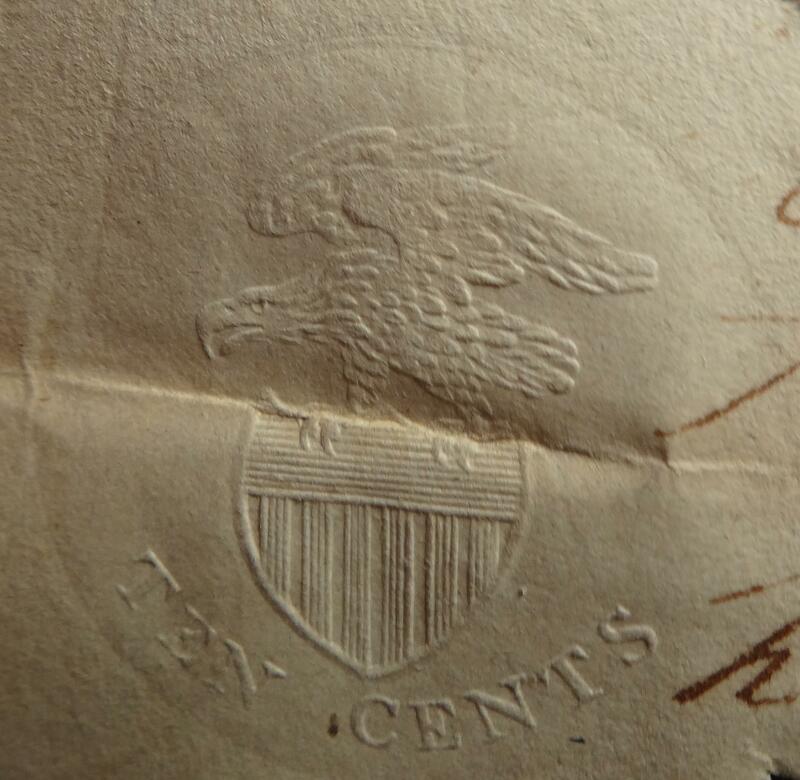 The Federals instituted documentary stamps effective July 1, 1798. The First Federal series included denominations of 4c, 10c, 20c, 25c, 30c, 50c, 75c, $1, $2, $3, $4, $5, and $10. They carried the State where issued. They were supse4ded on March 1. 1801 in the Second Federal series. Only some 4,000 of these issues are known, mostly the lower denominations. They were required on various documents including Bill of Ladings, bonds, bottomery, certificate of shares, Charter Party, Exemplification, foreign bills of exchange, inland bills of exchange, maritime insurance, other insurance, notarization, power of attorney. 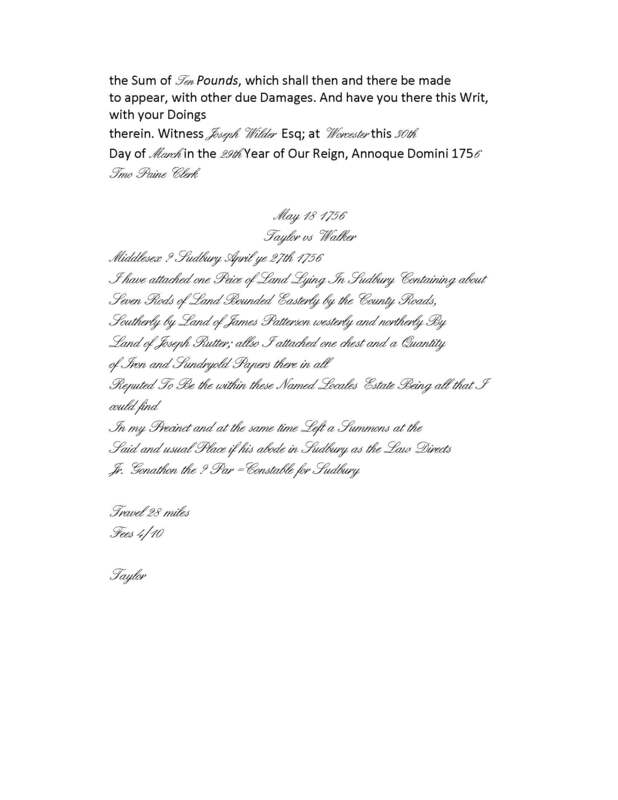 promissory note, protest, and Receipt of Legacy. Congress established sliding rates of each type generally based on the monetary value. Each State had separate identified dies with their name. 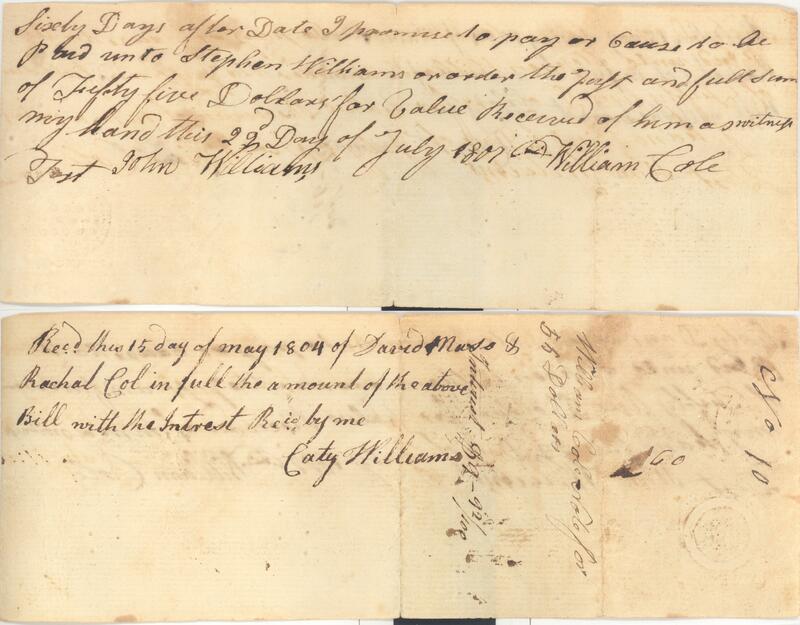 This is a Massachusetts promissory note in the amount of $78.38 signed by Joseph Williams Jr. to Jacob Williams dated September 8, 1798. The stamp, Scott no. 1RM110, Die 2, is located at the top left corner, is the 4 cents stamp. Yjere are 179 known. 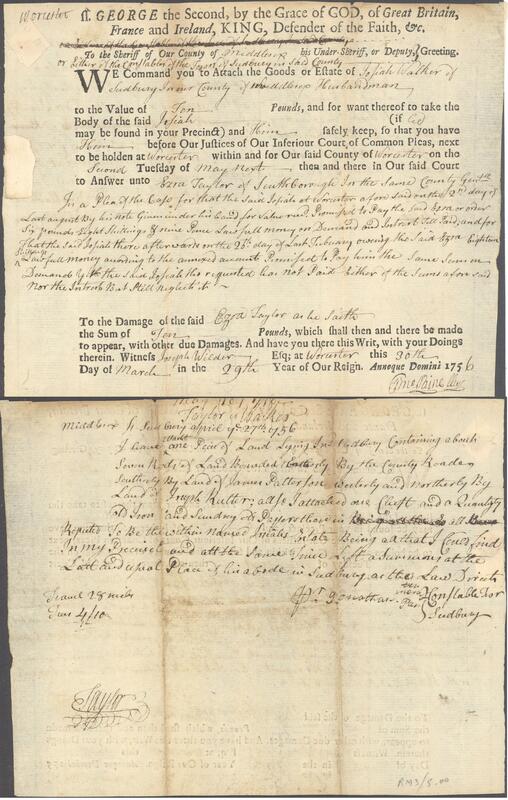 This $3000 bond was executed by George Frost Blunt Mariner, Mark Rogers, and Mark Simes on October 7, 1798 in Portsmouth, New Hampshire. The stamp, Scott no. RM129, is the New Hampshire issue of 75 cents is located at the top left corner. There are 35 known. This promissory note for £60 2/ 6d was executed by Jam. Tooley on January 1, 1800. The stamp, Scott no. 165, located at the top left corner, is the North Carolina issue of 25 cents. There are 54 known. 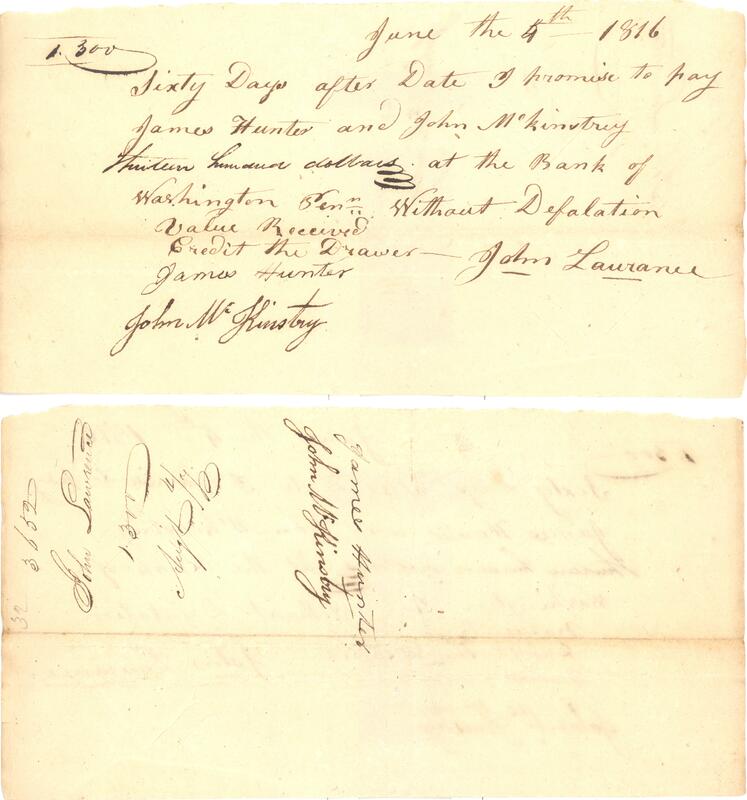 This promissory note was executed on July 21, 1798 by Tho. Hawthorn. 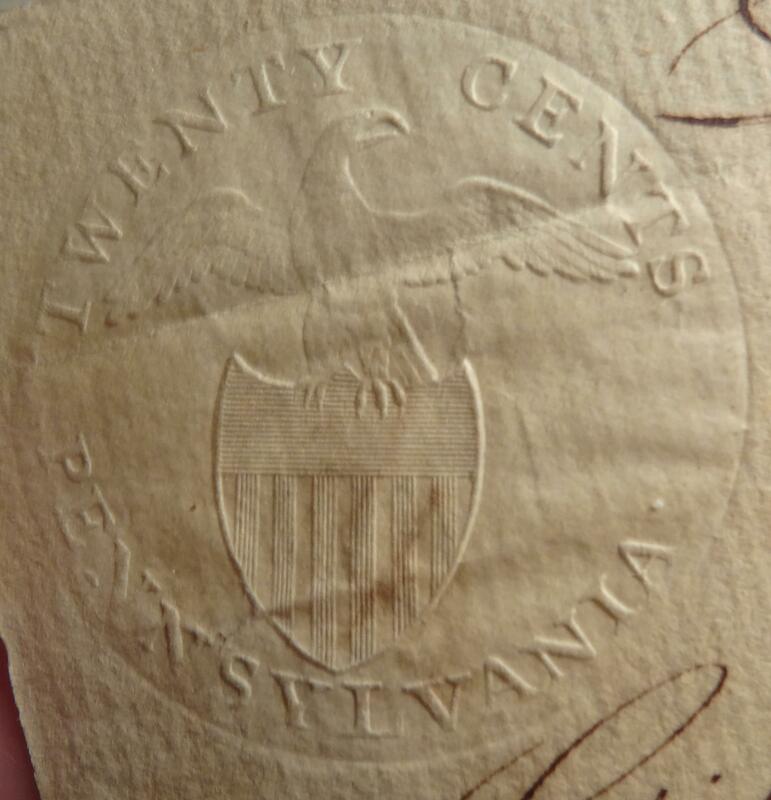 The stamp, Scott RM177, located at the top left corner, is the Pennsylvania 20 cents issue. There are 54 known. This promissory note for £30 / $100 Virginia currency was executed by Archibald Franklin & Elijah Weekes on August 24, 1799. The stamp, Scott no. RM241, is the Virginia 10 cents issue. There are 149 known. 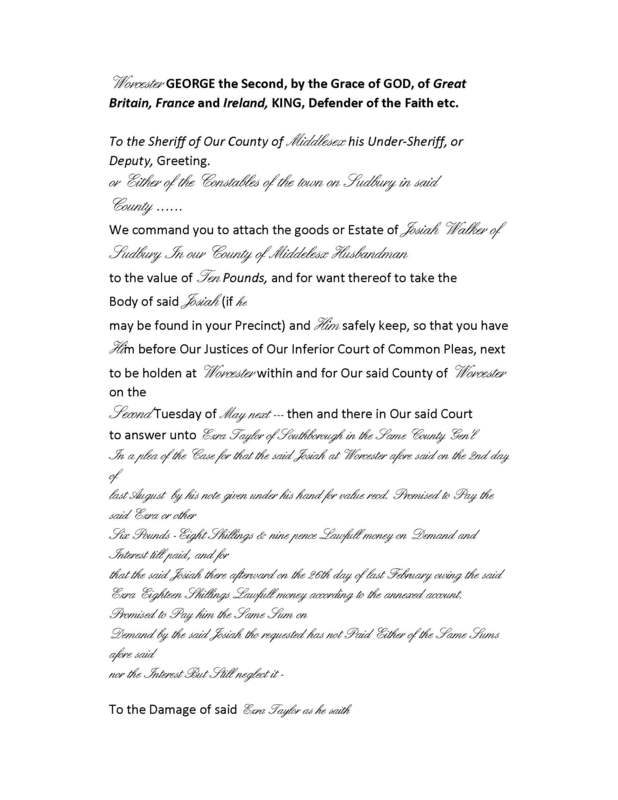 The second issue was i effect from March 1, 1801 to June 30, 1802. The same usage was as for the first issue. Each denomination utilized ac primary stamp and a counterstamp. These were embossed on threetypes of paper: lqaid paper with government watermark, wove paper withgovernment watermark, and no government watermark on either laid or woven paper. There was no State identity on this issue. 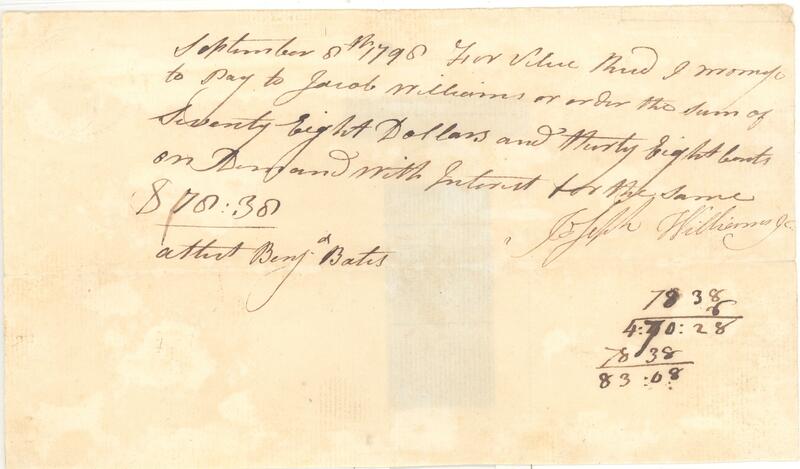 This promissory note for $55 was executed by William Cole on July 22 1801. The stamp, Scott no. RM260a, Die 1B, located at the left, is the 4 cents issue. Note the Second Issue has two stamps, one (the revenue stamp) with an eagle and the denomination and under that one (the Commissioner's counterstamp) wreath with 13 stars within with COM. REV. C.S. (Commissioner of Revenue Counter Stamp) and the denomination IV CENTS. 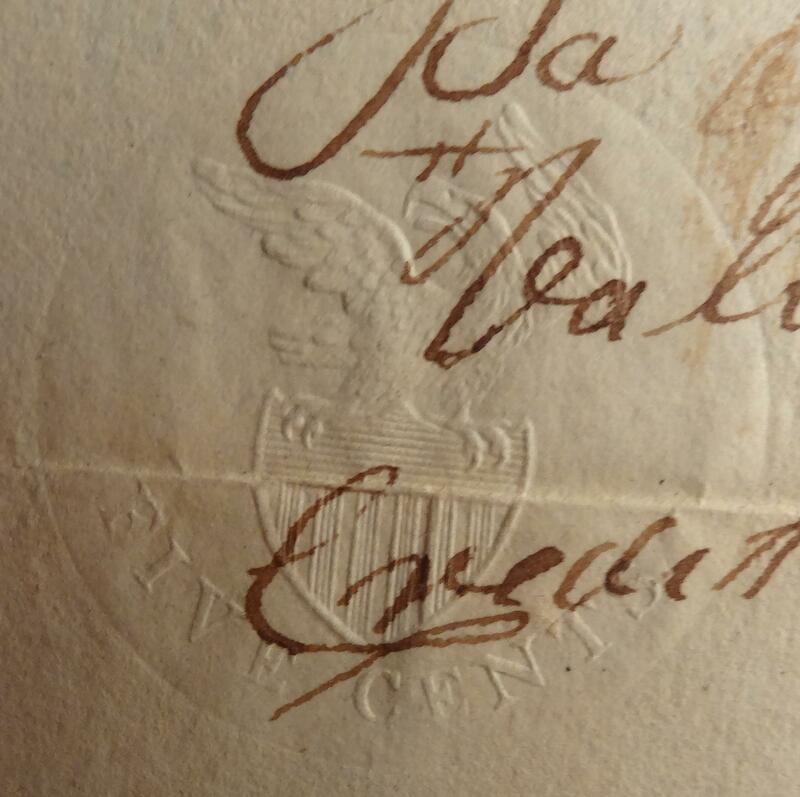 The paper is laid with the STAMP watermark. There are 142 known. This bond of £150 payable in "real gold or or silver lawful money of Pennsylvania" was executed by Valentine Emigh and Mathias Smyser on March 15, 1802.. The stamp, Scott no. RM263a, Die 1, located at the left, is the 25 cents issue. Note the Second Issue has two stamps, one (the revenue stamp) with an eagle and the denomination and under that one (the Commissioner's counterstamp) wreath with 13 stars within with COM. REV. C.S. (Commissioner of Revenue Counter Stamp) and the denomination IV CENTS. 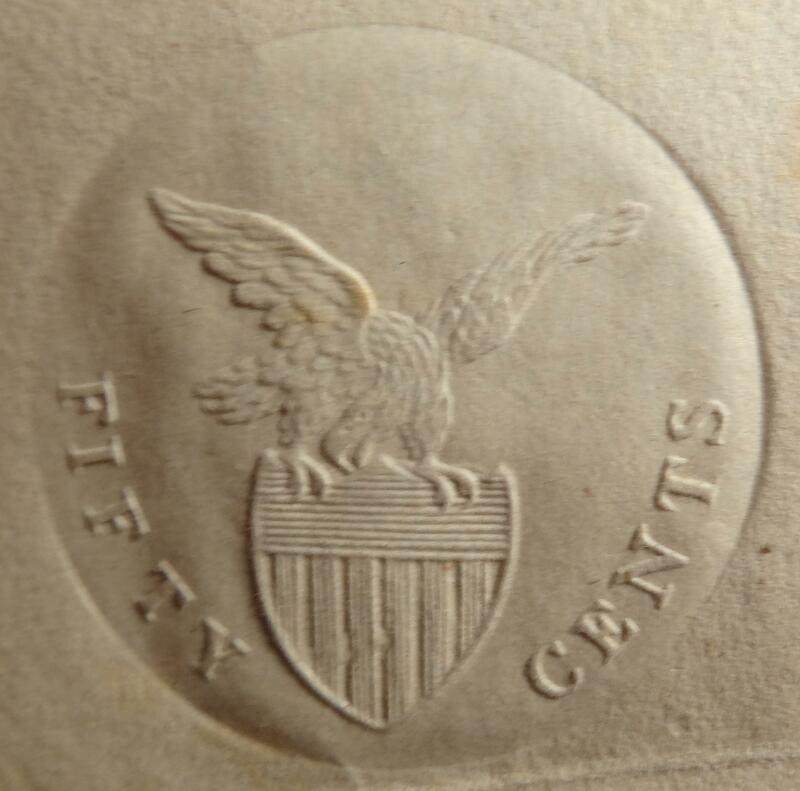 The paper is laid with the italic GEN STAMP OFFICE watermark. There are 110 known. The Third Issue was authorized from January 1, 1814, to December 31, 1817. Usage was much less limited that the earlier issues. Usage was only required on promissory notes, bills of inland exchange, and bills of foreign exchange. These were issued on five types of paper,: wove with government watermark, wove paper with no watermark, laid paper with a non-government watermark, laid paper with no watermark, and wove paper with non-government watermark. 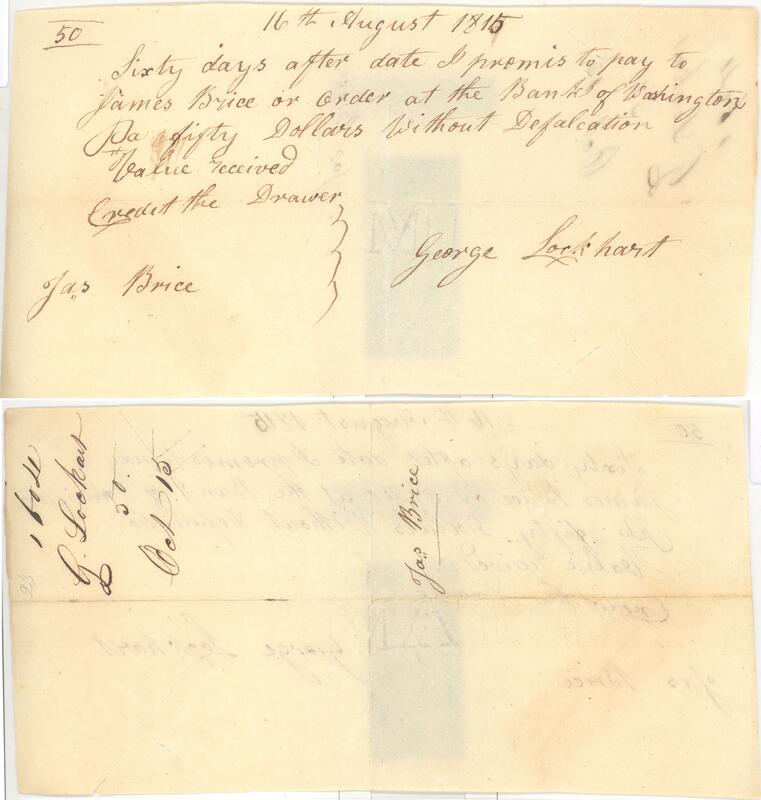 This promissory note for $50 was executed by George Lockhart on August 16, 1815. 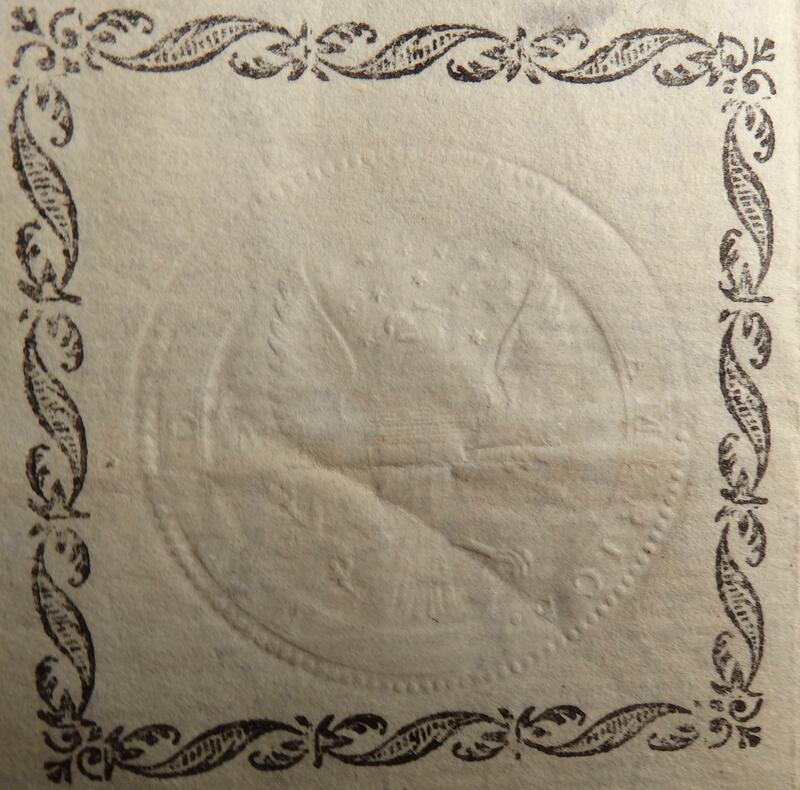 The stamp, Scott RM275a, Die 3, with the denomination of 5 cents is located at the left center of the note. There are 41 known. 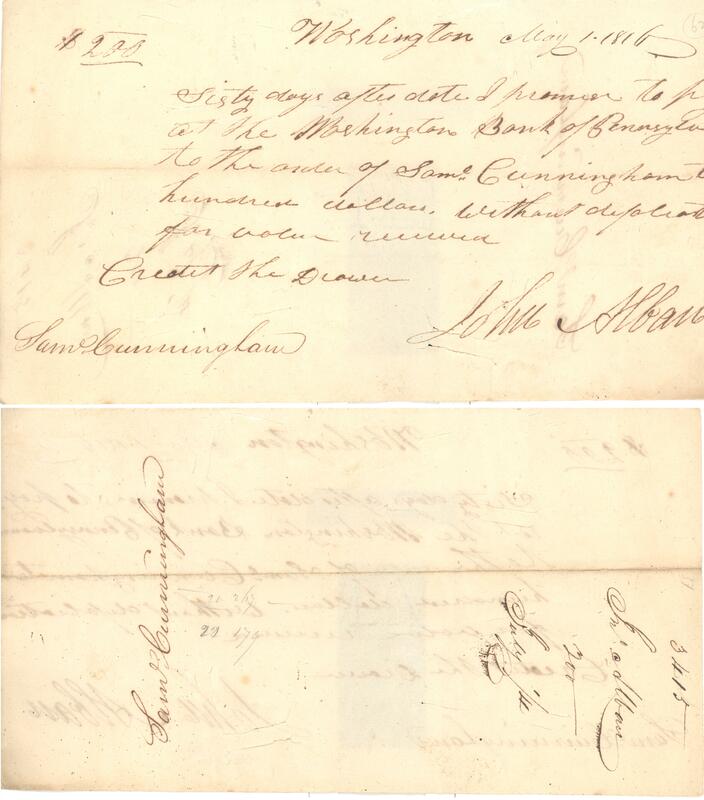 This promissory note for $200 was executed by John Alban on May 1, 1816. The stamp, Scott RM276a, Die 2, denomination 10 cents is located at left center. There are 56 known. 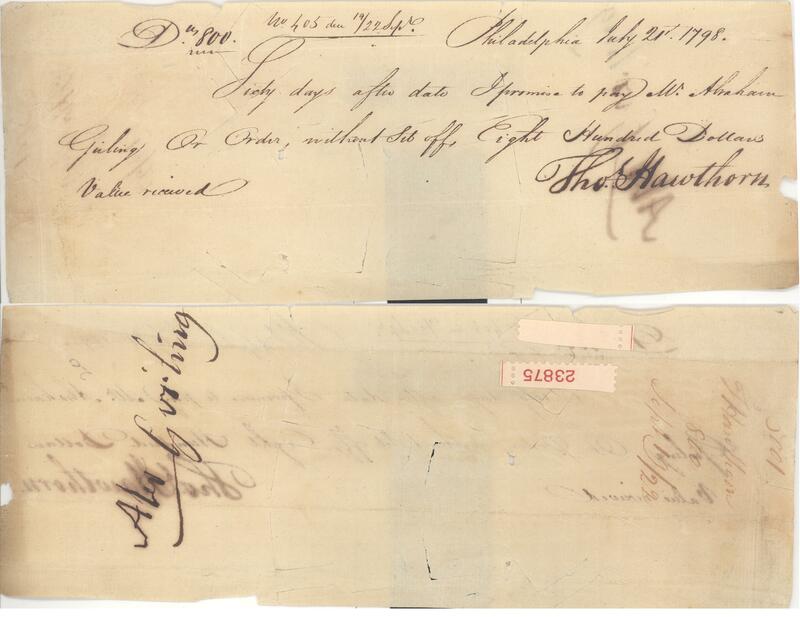 This promissory note for $300 was executed by Thomas Hopkins on November 23, 1815. The stamp, Scott RM277b, Die 3, denomination 25 cents is located at left center. There are 107 known. 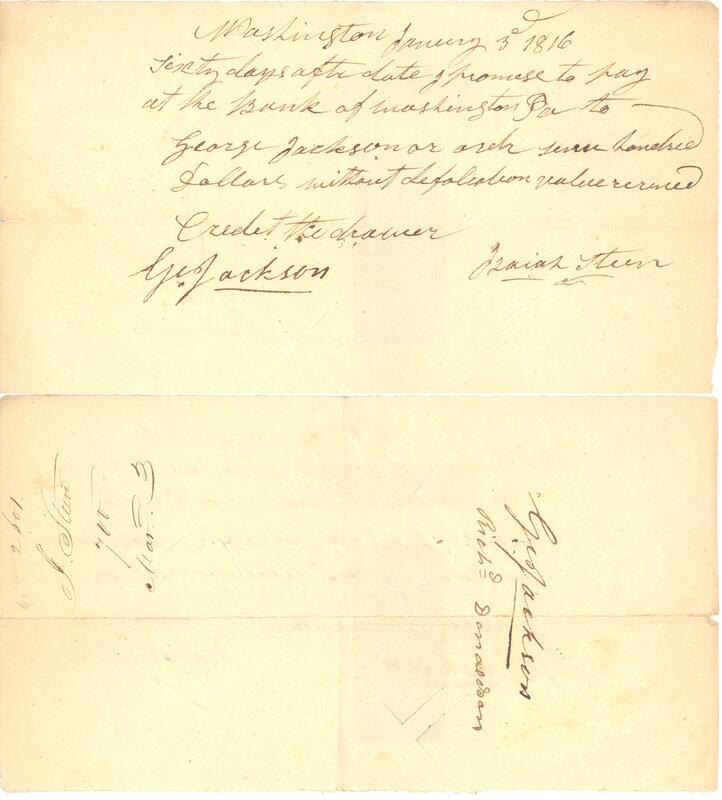 This promissory note was executed by Isaiah Steen on January 3, 1816. The stamp, Scott RM278a, Die 2, with denomination 50 cents is located at left center. There are 94 known. 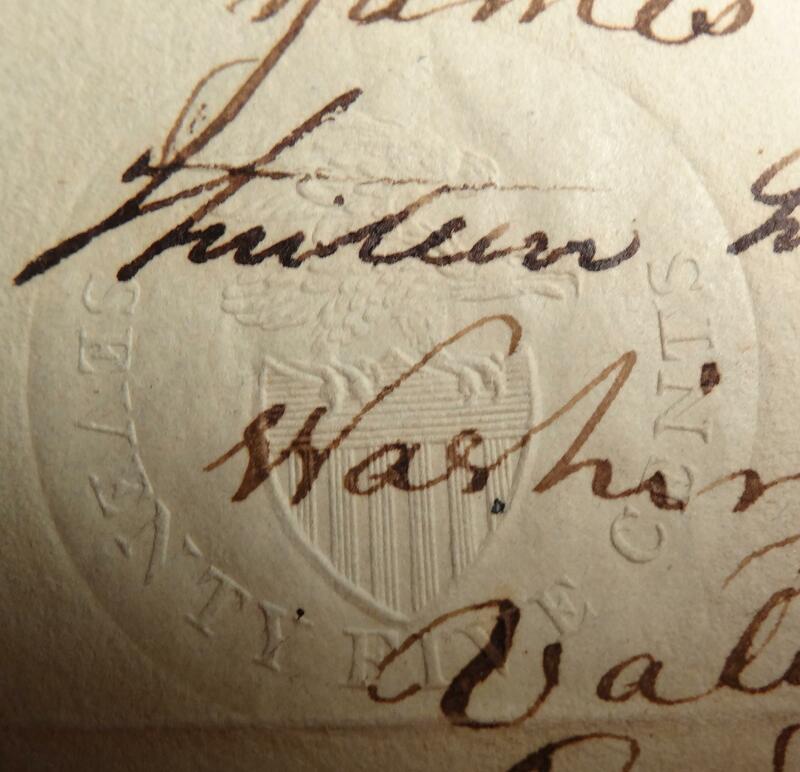 This promissory note was executed by William Hawkins on September 4, 1816. The stamp, Scott RM279a, Die 2, with denomination 1 dollar is located at left center on the reverse. The paper is watermarked STAMP US.. There are 35 known. 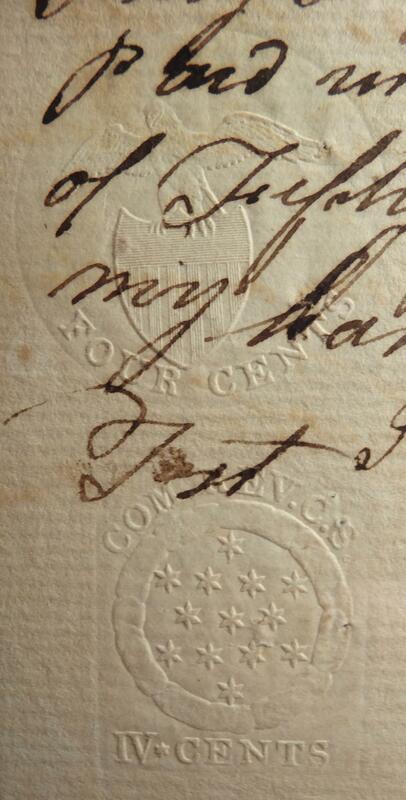 Supervisors seals were required as of April 1, 1791 originally for importation of tea. On July 1, 1791 alcohol spirits were added and on July 1, 1792, wines were added.. This is a Type S-d Supervisors seal attesting that duty has been collected from Thomas Gall for the cargo imported on this vessel. The inspection occurred in the port of Kennebunk (then in Massachusetts, after 1820, Maine) on September 16, 1802. The ship was the Alfred Jeffers an American vessel arriving from Dominica with cargo of 112 gallons of 4th proof rum. 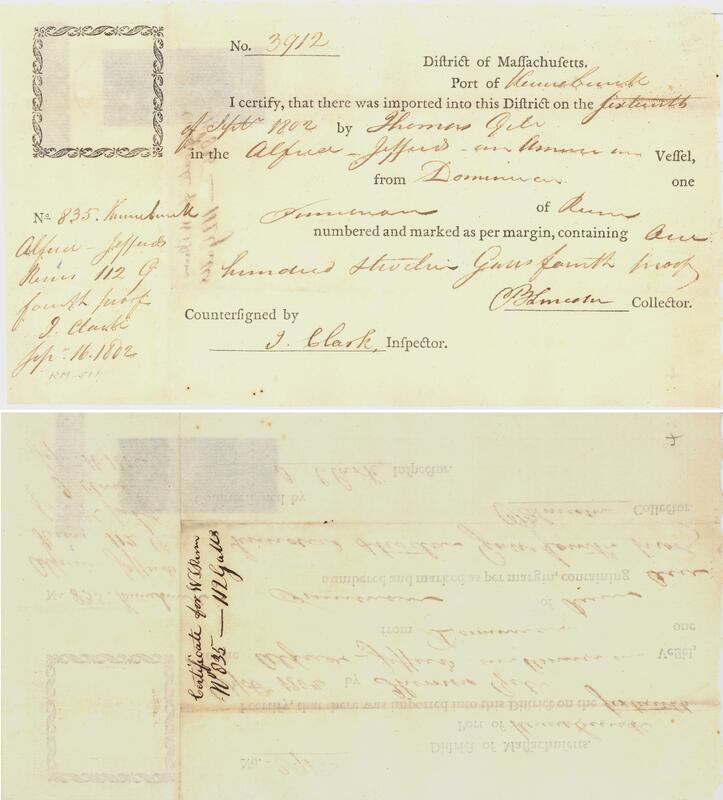 The tax was collected by B. Lincoln, and the inspector was I. Clark. The stamp, Scott no. RM511 was embossed within the box at the left top. 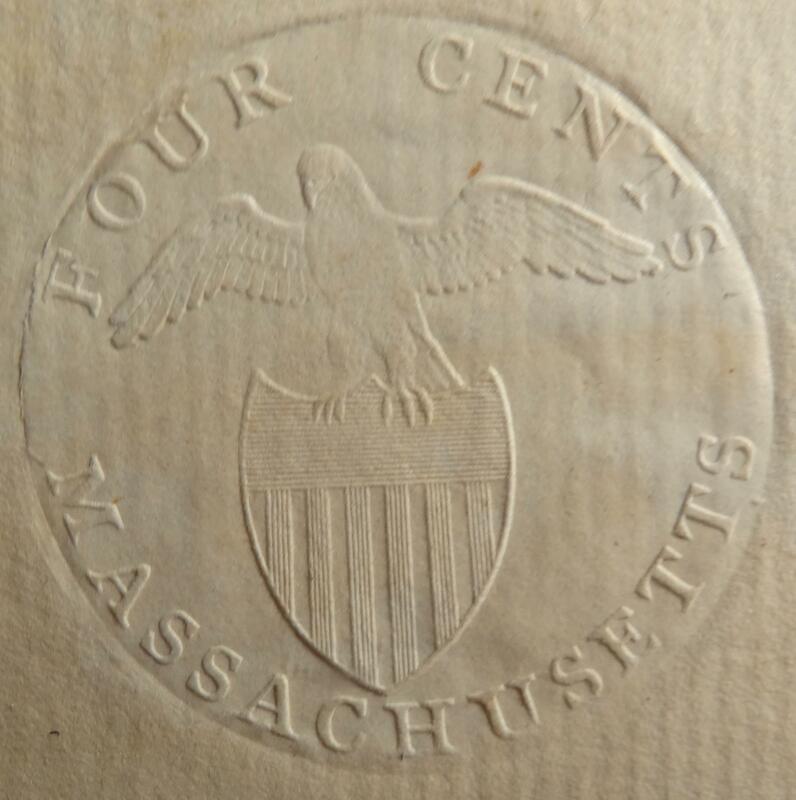 The seal has the an encircled American Eagle in the center with the letter M to the left denoting the State of Massachusetts. Within the outside ring is the legend UNITED STATES OF AMERICA. There are 86 known.